It may surprise you to learn that funnels are one of the most overlooked kitchen tools both by consumers and manufacturers alike. The designers at Pro Chef Kitchen Tools are chefs who understand the value and utility a good funnel set can bring to the kitchen and the household in general. With that in mind, the goal at Pro Chef Kitchen Tools was to create a funnel set that is so comprehensive and useful; it'll be the only set you'll ever need. The Pro Chef Kitchen Tools Stainless Steel Funnel Set is the culmination of that goal. Some new chefs may be wondering what kitchen funnels can do for them in their kitchen. The truth is that kitchen funnels have a variety of useful applications that most people don't think about in their daily lives-even when they use those applications in their daily lives. For instance, did you know funnels can make baking a lot easier? Also, they're essential to the art of mixing your own essential oils. Home vintners find them crucial to the winemaking process. And those are just common examples of what you can do with kitchen funnels. There are also more creative things you can do, such as craft a volcano with your child. The possibilities funnels bring are truly endless. 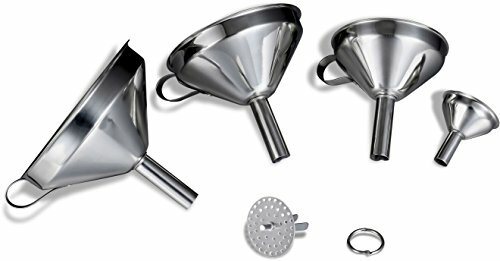 To meet your many and varied funneling needs, the Pro Chef Kitchen Tools Stainless Steel Funnel Set has four funnels ranging in size from extra-large to a mini flask funnel. Large funnels are great for baking and pouring other highly viscous liquids, while mini funnels are ideal for mixing essential oils or making your own herbal tonics. To maximize versatility, the Stainless Steel Funnel Set from Pro Chef Kitchen Tools come with strainers; with funnel strainers, you can do things like reserve grease or gravy with ease, limiting the risk of burning yourself. These funnels are built to last you a lifetime which is why they're made of pure stainless steel, so that you can enjoy them for many years to come. *Not nestable or stackable set. Even if your carving fork only makes an appearance when it's time to carve the turkey at Thanksgiving, the carving fork is an essential and often overlooked kitchen tool. The Stainless Steel Carving Fork by Pro Chef Kitchen Tools is designed to impress veteran meat carvers while offering the ease of use and versatility those who carve meat less frequently require. The designers at Pro Chef Kitchen Tools believe that quality material is the foundation of any great product, which is why our carving forks are made of the highest quality stainless steel. A good carving fork should last you a lifetime, which is why stainless steel was the obvious material to use when crafting the Pro Chef Kitchen Tools carving fork; stainless steel is tough, never rusts, and looks great for years to come. Our Stainless Steel Carving Fork is forged to perfection while its tines are sharp enough to spear meat without damaging the look or texture so the roast or turkey you serve always looks its best when it's presented to your guests. The Pro Chef Kitchen Tools carving fork is designed to look great in your kitchen and at your table. To achieve this great look, the Pro Chef Kitchen Tools designers combined high-quality stainless steel with a modernly minimal design aesthetic that allows them to look impressive while at the same time not stealing the spotlight so that you can showcase your meat masterpiece with confidence and pride. The Stainless Steel Carving Fork is designed to protect you and your fingers when you carve meat at the dinner table, thanks to its long handle and dual tines. Furthermore, it's dishwasher safe, because Pro Chef Kitchen tools knows your family's health is important to you, which is why it's important to us. - You never know what may need pouring into and out of stainless steel funnels. It may be cold beverages, or it could be hot liquids straight from the stovetop. With industrial-grade stainless steel and an intelligent design, these steel funnels can stand up to nearly anything you need to move. They will hold their useful shape for years, giving you better use, which inevitably results in delicious food! - To make handling these large funnels effortless, the three largest in this funnel set are designed with stainless steel handles, while the small flask funnel has an extending lip with a hanging hole. Easily control the funnels and never worry about spilling oils, liquids, and whatever else you might have to pour. With these handles, pouring with funnels is a simple, easy process that anyone can do! - The complete large funnel set is made from industrial grade stainless steel that not only gives the products a bright, clean finish, it also makes them durable through years of use. Thanks to high-quality materials, you can count on these funnels to deliver long-term performance and decades of convenient pouring. Make sure you have a mini funnel that will last with this fantastic set and the kitchen will be making great meals for everyone! - The larger units from this kitchen funnel set have a detachable strainer that makes pouring thick or chunky liquids, such as sauces or grease, more convenient. Stainers can also be removed, providing greater versatility to your kitchen. When you pour into bottles and want to make sure that none of the solids are allowed inside, this you'll be glad you ordered a steel funnel with a top-quality strainer. - Cleaning the kitchen shouldn't be a hassle. Fortunately, every steel funnel in this set is completely dishwasher safe, allowing you to spend your time on more important tasks. Pass the afternoon pouring liquids, separating solids with the strainer, or using the funnel for canning and bottling; once you're done, simply add it to the dishwasher and enjoy the fruits (or maybe the juices!) of your labor! - The carving fork is a central tool for meal prep and presentation. It must be solidly constructed and able to enter even the toughest meats without damaging them inside. Stainless steel forks are the best tools for such a job. This utensil made of stainless steel that is tough enough to resist damage from frequent use while protecting a carver's hand. It can go through thick or tough meats and pick up freshly sliced meats with ease. 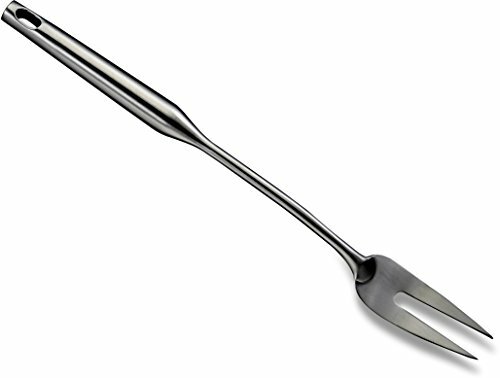 - Steel forks cannot function properly without a solid base from which they are built. This fork offers a traditional handle on top to grip the fork with. The rest of it is circular and smooth with for deeper meat penetration. It balances out the lack of longer tines on the fork and gives the carver stability while cutting. The top handle features enough surface area for a firm grip designed not tire hands or bend while in use at home or in a commercial setting. Warranty Tough durable construction and fine workmanship details are confidently backed by the manufacturer's risk-free LIFETIME REPLACEMENT WARRANTY that covers any defect in materials or craftsmanship in your investment when purchased from authorized sellers. Tough durable construction and fine workmanship details are confidently backed by the manufacturer's risk-free LIFETIME REPLACEMENT WARRANTY that covers any defect in materials or craftsmanship in your investment when purchased from authorized sellers.